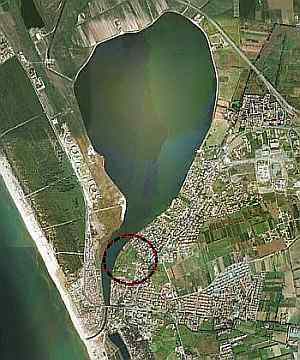 Lago di Patria (or Lago Patria) is a 25-km drive north of Naples. In ancient times, it was fed directly by the Clanius river. That river, however, was diverted somewhat to the north in the 1600s (mentioned below as the Regi Lagni project); today, the lake still has some underground freshwater sources as well as abundant rain run-off but since it has a direct outlet to the sea (photo, right) it also takes in saltwater. Since 1999 the 2-sq km lake has been part of the protected Foce Volturno nature reserve, but the signs of decades of earlier overbuilding are everywhere and, indeed, beyond the confines of the reserve, new buildings grow like toadstools. It is difficult to see the area for what it was historically —meaning at the time of the Romans. I don't mean Imperial Rome, but rather a time well before the beautiful toga people of the first century BC started enjoying local thermal waters and dotting the local coastline with luxurious villas. It was a time when Rome was still battling mortal enemies from Carthage and at the same time trying to consolidate a hold on the peninsula. The Campanian coast, in particular, was a very difficult area of long conflict over centuries among many contenders: Greeks, Etruscans, Romans and Italic tribes such as the Samnites. The second Punic War ended in 202 BC with the Roman victory over Hannibal at the Battle of Zama (in modern-day Tunisia). The Roman commander was Scipio Africanus (236–183 BC) (pictured), so-called because he had invaded North Africa to fight Hannibal—and had won. (This was shortly after he had defeated Carthaginian forces in Hispania, securing that territory for Rome. He is viewed as one of the greatest military commanders in history.) Rome was then free to focus on the southern Italian peninsula. That entailed not just solidifying its hold on the large former Greek cities such as Neapolis (which would not become a Roman principality for another century), but founding new smaller Roman colonies throughout the south. In 194 BC, Rome sent out founding colonists to settle and protect five coastal sites in Campania: Volturnum, Puteoli (Pozzuoli), Salernum, Buxentum (Policastro Bussentino, well south of Salerno), and, the case in point, Liternum. The Liternum colony was roughly in the area circled in the photo (above). The new Roman settlers were largely veterans of the second Punic war, experience that would serve them in defending the coast from enemy fleets and pirates. Livy tells us that shortly thereafter, in 184 BC, the brilliant general who had secured the future of Rome, Scipio Africanus, was accused of bribery and quit public life in disgust. He moved to Liternum to live out his life, thus becoming the first distinguished Roman to have owned a "country estate" in the south. Sources say that he was held in such awe that pirate marauders would stop by, not to maraud, mind you, but just to see the man who had defeated Hannibal. Scipio died in Liternum at the age of 52 and is said to have willed this inscription to be placed on his tomb: Ingrata patria, ne ossa quidem habebis—"Ungrateful motherland, you will not even have my bones." That cannot be confirmed since his tomb has never been found. Liternum enjoyed renown just by association with Scipione (somewhat like Napoleon and Elba, I imagine). The colony did well, also, in the Age of Augustus thanks to new settlers in the year 31 AD and the construction of the Domitiana road that made Liternum a major stopping point on this new main route from Rome to Naples. In the 5th century AD the area gradually swamped up and the original settlement disappeared. The area was a reserve of a local Benedictine order in the Middle Ages and profited from land reclamation as part of the Regi Lagni system of canals started by the Spanish in the early 1600s. In 1932 and again immediately after WWII significant excavation was done by archaeologist, Amedeo Maiuri, at the site. He uncovered the remains of the forum with its capitolium (temple dedicated to Jupiter), the basilica and theater, ruins of dwellings and roads, the remains of a portico, of a thermal complex and an amphitheater. Most recently, in 2009, there were additional finds, many of which wound up in the Baia Archaeological Museum in the Liternum Room. Unfortunately, that museum is currently in an open-again closed-again limbo due to lack of funding. Since 2009 the area has been part of the Liternum archaeological park, an area of some 85.000 sqm (c.20 acres) that may be visited. Recent accounts in the papers say that a group of archaeology students from the Freie Universität in Berlin have requested permission to explore the site further. D'Arms, John H. "The First Coastal Villas, The Second Century B.C." in Romans on the Bay of Naples and other Essays on Roman Campania. Edipuglia, Bari. 2003. Maiuri, Amedeo. "Liternum" in Passeggiate Campane. Rusoni, Milan. 1990.